The Charles partnered with Sequential Brands Group, Inc. for a complete overhaul of Ellen Tracy's digital presence to coincide with the brand's 60-year anniversary and collaboration with Paula Patton. 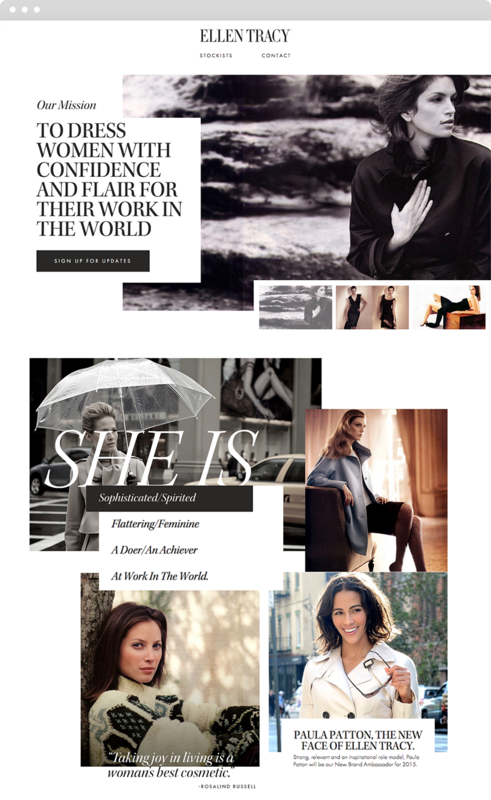 Jane Content Studio partnered with Sequential Brands Group, Inc. for a complete overhaul of Ellen Tracy's digital presence to coincide with the brand's 60-year anniversary and collaboration with Paula Patton. (i) A Microsplash site was created that focuses on brand storytelling and the brand's history, while serving as a teaser for the new site. (ii) The website seamlessly integrated the Microsplash's identity design and user flow, bolstered with comprehensive functionality. Launching the site in phases was a key piece of the digital marketing strategy devised by Jane Creative Studio. The flexibility enabled Ellen Tracy to showcase the new brand aesthetic and to communicate all campaign news as and when it happened – all while the main site was still in production. With the visual aesthetic and key site features defined, the transition from Microsplash to main site was seamless. During research on the target market and users of Ellen Tracy's website, Jane Creative Studio observed and was inspired by how users of the demographic interacted with quotes, inspirational and otherwise, coupled with images created for the “Pinterest Generation.” Jane Creative Studio created a series of artwork, pairing encouraging quotes about women’s life with classic Ellen Tracy campaign pictures to tell the brand history with relevance and to resonate the brand philosophy with viewers. Ellen Tracy's archives held a wealth of content, including campaigns featuring iconic brand ambassadors like Christy Turlington and Cindy Crawford. Jane Creative Studio helped Ellen Tracy organize their creative assets to better leverage existing content and showcased the brand's prominent history to new audiences. Jane Creative Studio crafted a visual and verbal strategy to inspire today's modern woman while paying homage to the brand's timeless appeal. The nod to Ellen Tracy's history was complemented with interactive features highlighting the brand's latest developments. Easily updatable content blocks promoted the brand's news, including a collaboration with Yahoo! and Paula Patton, the brand’s newest ambassador. Through the phased approach, Jane Creative Studio was able to collect valuable user insights and behavioral analytics on what customers wanted from the site. These statistics were later used in the wire-framing process to inform the site’s user flow and hierarchy, improving the overall experience. The online audience insights were also beneficial for the peripheral activities of the brand's marketing team. To connect with Ellen Tracy's latest campaign "Women Hyphenated," Jane Creative Studio designed and developed the site with comprehensive features. 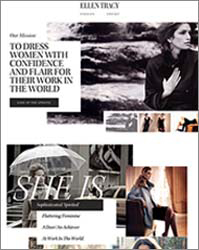 These features leveraged diverse content types, showcasing the womenswear, brand story, values and philosophy. Integrated with the third party CDN, the carousel of Ellen Tracy's homepage was flexible and easy to maintain in the backend. The dynamic content can be either image or video, which could be played in a lightbox to ensure the most immersive experience. The signup process should be relevant and engaging to maximize effectiveness. Instead of a standard signup form, Jane Creative Studio designed a two-step questionnaire in line with Ellen Tracy’s brand philosophy. The feature transformed the signup process from a standard form into a direct interaction with the brand’s voice and ethos. The main goal was to create a flexible platform to showcase the seasonal collection and drive product awareness. The brand was not only encouraged to showcase the aesthetic, but also to grow customer affinity with the products, encouraging retailer purchases. By utilizing browser cookie data and leveraging ExpressionEngine's capabilities, Jane Creative Studios created the "Love List," a faux-commerce experience with a custom no-membership-required wishlist component. Each item in Ellen Tracy's collection can be added to a temporary wishlist. This feature worked automatically with each new item added in the backend. Using a combination of a user's session and a temporary cookie, the wishlist was tied into a browser session instead of a member's account, so no membership database setup was needed. With the fully flexible content management system, the client was able to manage entire collection and to control every last detail on the site. Pushing the limits of the traditional lookbook, Jane Creative Studio added more features such as moving images, details pages, and the functionality to save a look to a wishlist. The user stories and user flow were carefully planned, and the design was precisely executed in order to ensure the navigation experience was smooth and not confusing. The Ellen Tracy website was strategically enhanced with a suite of interactive features to engage the target audience and convey the brand's philosophy. 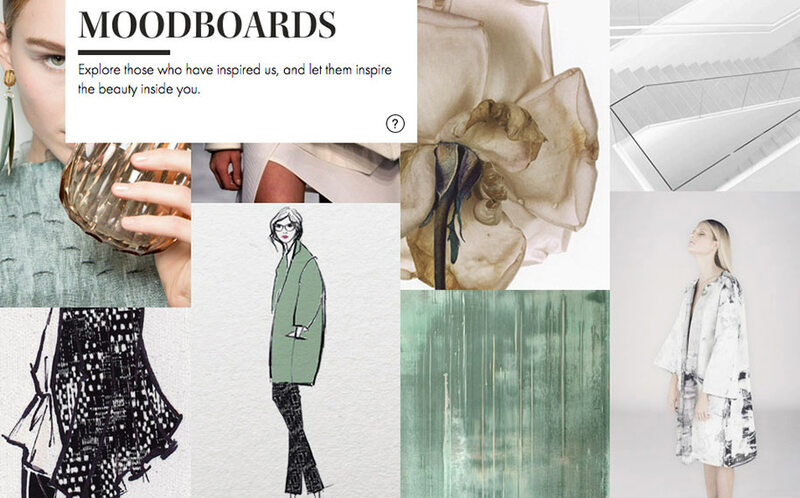 Jane Creative Studio implemented a mood board component on the News Page that integrated with Pinterest, extending the campaign's reach by targeting a generation who enjoys exploring and sharing inspirational visuals through social media. The "24 Hours with Paula Patton" slideshow was transformed using jQuery and CSS3 to turn it into a fun, interactive component that echoed Ellen Tracy’s vibrant campaign and showcased the diversity of their latest collection. An interactive timeline took the audience on a journey through Ellen Tracy's history. Browsing across devices is becoming increasingly common. With almost half of the website traffic coming from tablet and mobile devices, Jane Creative Studio placed responsive design at the forefront of the strategy. The development approach for every project is determined by the understanding of the individual client's audience and needs. Ellen Tracy's website stemmed from a mobile-first approach which ensured a seamless experience, optimized for customers on the go and to be compatible across all devices.